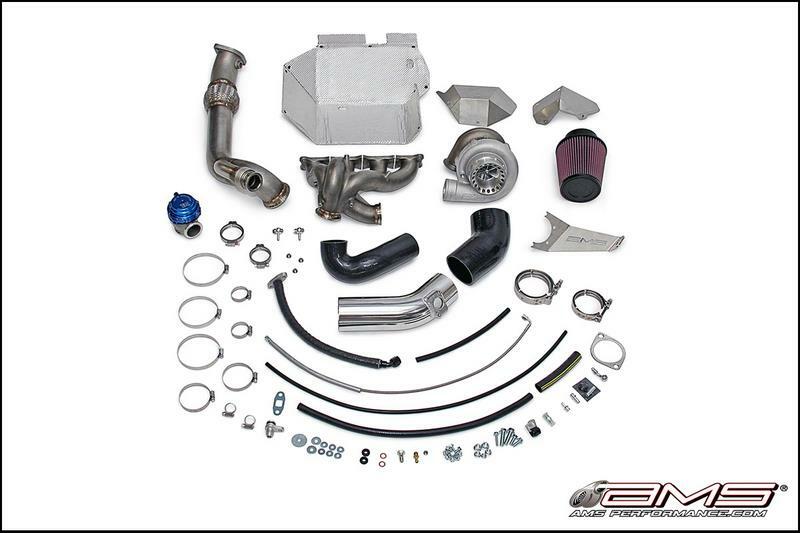 The AMS EVO X 950XP Billet V-band Turbo Kit is the most advanced and reliable kit on the market. Loaded with the latest turbo technology, this race-proven package not only produces unmatched power and spool, but is also designed to withstand the abuse of professional Motorsports with 2 National Championships to prove it! In 2008 we set out to design a kit that matched the quality of OEM Mitsubishi components while providing the extraordinary power and response AMS is known for. To accomplish this level of quality, reliability and performance, we created the industry’s first cast tubular V-band exhaust manifold. By applying cast stainless steel construction, we eliminated the restrictive design geometry and the possibility of cracking found with hand-fabricated headers. By casting the manifold, we were able to maximize exhaust flow while utilizing the small space available between the engine and firewall of the EVO X.
V-band turbos use a lightweight housing which has proven to flow better, spool quicker and make more power than their flanged counterparts. They also require less complex hardware which provides easy fitment and a durable seal – eliminating the need for a gasket. 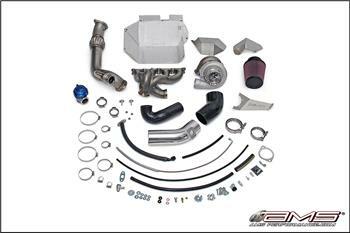 At AMS we are constantly improving our turbo’s in search of the ultimate balance of power and response for your car. The new AMS 950XP EVO X Turbo features a newly revised wheel design featuring a slightly larger turbine for even more top-end power without sacrificing spool up or response! You still get the adequate response of our old 950R down low, with the added benefit of increased horsepower throughout the power-band. In addition we include a stainless steel turbine housing for added strength, increased heat capabilities and superior corrosion resistance. The 950XP is still considered a drag racing turbo but can be used on the street. With the cramped EVO X engine bay, the added heat associated with higher power output becomes an issue. There have been unfortunate incidents of engine fires on EVO X’s with aftermarket headers. AMS has this covered with a comprehensive heat shield to protect your firewall from the extra heat. In 2009 AMS campaigned two EVO X’s in the Redline Time Attack series using the AMS EVO X Turbo Kit. During that year, not only did both cars win their class championships and set track records at each event, they also proved that the AMS kit can take the extreme abuse of professional competition. With over 6000 miles of track abuse at wide open throttle for an entire racing season, each turbo kit performed flawlessly without skipping a beat… now that is AMS quality you can rely on! The same AMS product you purchase is the same product found on our race cars!